2013 Hot Springs Documentary Film Festival opens and closes with big surprises! 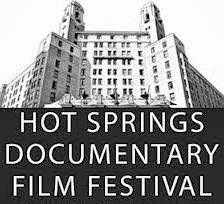 The 22nd annual Hot Springs Documentary Film Festival will be held at the Arlington Hotel October 11-20, 2013. This year’s festival has been called the “best ever lineup of documentary films in its history” by the Arkansas Times. The opening night film, “Good Ol’ Freda” will be preceded by the annual Champagne and Popcorn Reception at 6p.m. Freda Kelly, The Beatles’ longtime secretary and fan club manager and subject of the documentary, will be in attendance. For the first time in 50 years, Freda will be speaking publicly about her role in the lives and careers of John, Paul, George and Ringo. The closing night film on October 19 also offers a big surprise with Jose Canseco in attendance. The world premiere of “Jose Canseco: The Truth Hurts” will be shown during the closing reception which starts at 6:30pm. In between these bookends of the festival, attendees will find at least 100 documentaries, a variety of workshops, special guests, and receptions throughout the 10 day event. Tickets and passes can be purchased at the box office in the Arlington Hotel, or online. Whether you’re able to attend the entire festival, or just a few days, you’ll want to make your Hot Springs area lodging accommodations now. We’ll fill you up with Breakfast at Tiffany’s each morning, and give you a peaceful room to relax in each night.